Walking in Morocco awakens your senses. Just imagine the scent of spices wafting out of villager's houses, the patch of colours from the ochre buildings, fruit orchards, lush green valleys and snow-capped peaks. 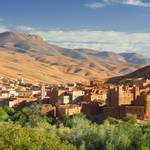 Join us as we discover this beautiful country, from the hustle and bustle of Marrakech to the peaceful Atlas Mountains. Today we arrive into bustling Marrakech. We will transfer to our hotel, our home for the next 7 nights, where we will enjoy a welcome drink and a short information meeting before having dinner at the hotel. After breakfast, it is time for our first walk. 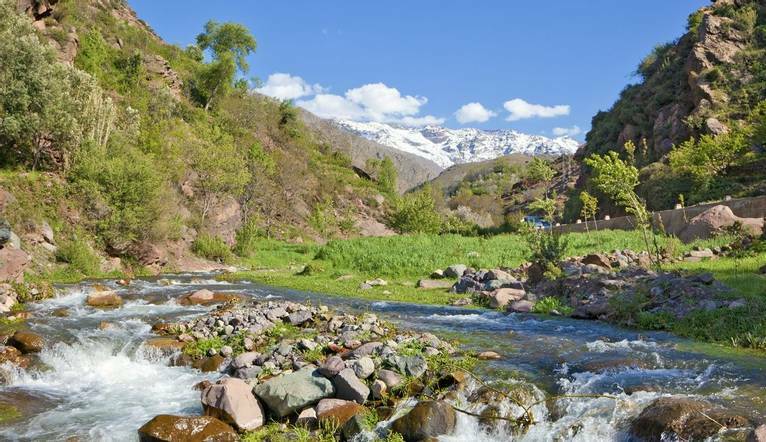 We will transfer to the small village of Imlil, located in the heart of the Atlas Mountains, and enjoy a walk that takes in the many traditional villages. Afterwards we will transfer back to Marrakech and enjoy Christmas Eve dinner. 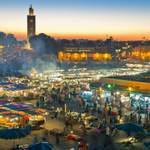 Today we will experience a full day city tour of Marrakech. A former imperial city in western Morocco, it's a major economic centre and home to mosques, palaces and gardens. The medina is a densely packed, walled medieval city dating back to the Berber Empire, with maze-like alleys where thriving souks sell traditional textiles, pottery and jewellery. A symbol of the city, and visible for miles, is the Moorish minaret of 12 Century Koutoubia Mosque. Today our journey begins into the High Atlas Mountains as we embark on our trek through the famous olive groves of Ouirgane, finishing in Marigha. After lunch we will have some time to discover the area before we transfer back to Marrakech and our hotel. 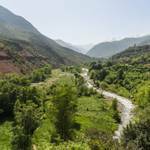 This morning we will leave the hotel and drive to Ourika to discover Ourika Valley, Siti Fadma and many other villages of the area. We can enjoy the natural beauty and fresh air over a lunch stop. We will then transfer back to hotel for the evening. After an early breakfast we will transfer to Ouzoud Waterfalls: one of Morocco’s natural wonders. 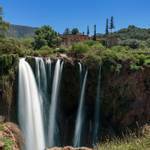 We will enjoy the beauty of the waterfalls and the mountains of Ouzoud. We will have a chance to meet some of the locals and discover the area before we transfer back to Marrakech and our hotel. Today we will drive to Amizmiz before embarking on our final walk. Amizmiz is an ancient town that has been part of recorded history for centuries. 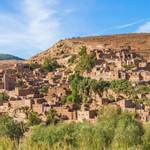 It lies at a critical juncture point between Marrakech to the north and the vast number of small, remote Berber villages that are spread throughout the High Atlas mountains. We will transfer back to our hotel before we head out to a local restaurant for our farewell dinner. After breakfast we will transfer back to Marrakech airport for our return flight back to the UK. 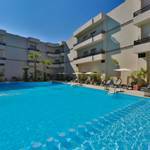 Located in the Agdal neighbourhood of Marrakech, our hotel overlooks the Oukaimeden Mountains. Nearby attractions include the Palace of Bahia and Badi and the Souk market is a 15 minute drive away. Hotel facilities include bar, 2 restaurants, outdoor pool, spa & wellness centre (extra charge) and a concierge service. Room facilities include air conditioning, room service (extra charge), safety deposit box, balcony with views of the pool or sun terrace, LED satellite TV and free Wi-Fi is available throughout the hotel. The transfer time from the airport to the hotel is approximately 15 minutes, depending on weather and traffic. Daily guided walks are included in the programme. Your walking guide will advise you in resort of the daily programme. The walking programme is graded as Medium and you can expect to walk between 10-14km per day, with some ascents/descents and rough underfoot terrain. Should you wish to take a day off from the walking programme - this will be possible on certain days of the holiday and you are most welcome to. This can be discussed with our guides in resort. We wish you to have the best holiday possible. It is your responsibility to ensure that you are fit and well enough to take part in your chosen activity holiday. If you are unsure as to whether the walks are within your capabilities, please contact the office to discuss this matter, thus making sure you appreciate the terrain that you will be walking. You could be walking across uneven ground in some areas and extreme care must be taken, especially if wet. If used to using a pole/stick, it is advisable to bring it. Please appreciate the route and content of the holiday may change at the time and at the discretion of the guide/organiser, should conditions require. Solo’s Holidays Ltd cannot be held responsible for personal injury, accident or damage to property whilst on these walks other than incidents arising out of the company’s negligence. The guide has the right to refuse to guide a walk with anyone not properly attired.